The SWF K-UH1506D-45 is one of the most versatile embroidery machines on the market because it has Dual Function Technology. SWF’s patented Dual Function Technology gives this machine the ability to operate as either a tradition 6 head machine or as two separate 3 head machines. 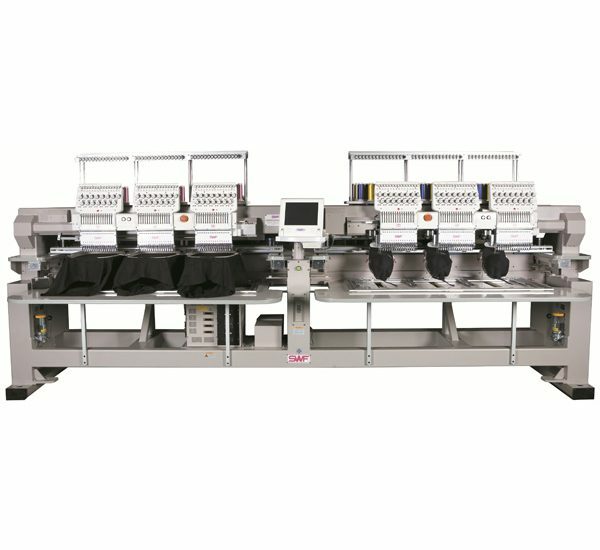 The SWF K-UH1506D-45 is controlled by a 10.4 inch touch LCD display and can embroider two different designs on both flat hoops and caps simultaneously. Coming standard with the Quick Change Cap System and the SWF Automatic Oiling System makes this machine the most advanced on the market. If you are a starting embroidery shop or mid-sized shop looking for cutting edge technology then the K-UH1506D-45 is right for you. Contact us today for a quote! Expanded Memory Size Up to 100 designs can be saved to the memory and the capacity includes two million needles. Float Stitch Function Needle bar can be moved forward or backward in the units of 1, 100, 1000, 10000 needles and color cord without actual embroidery.